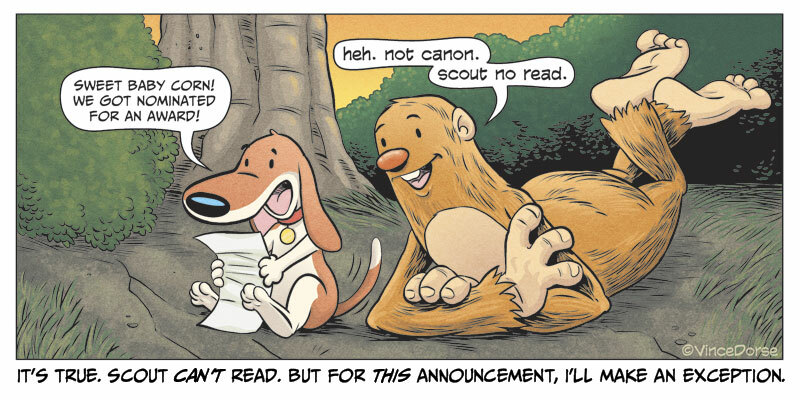 Untold Tales of Bigfoot Nominated for Another NCS Reuben! Here’s some fun news (for me, anyway). Untold Tales of Bigfoot has been nominated by the National Cartoonists Society for a Silver Reuben in the Online Comics: Long Form division. 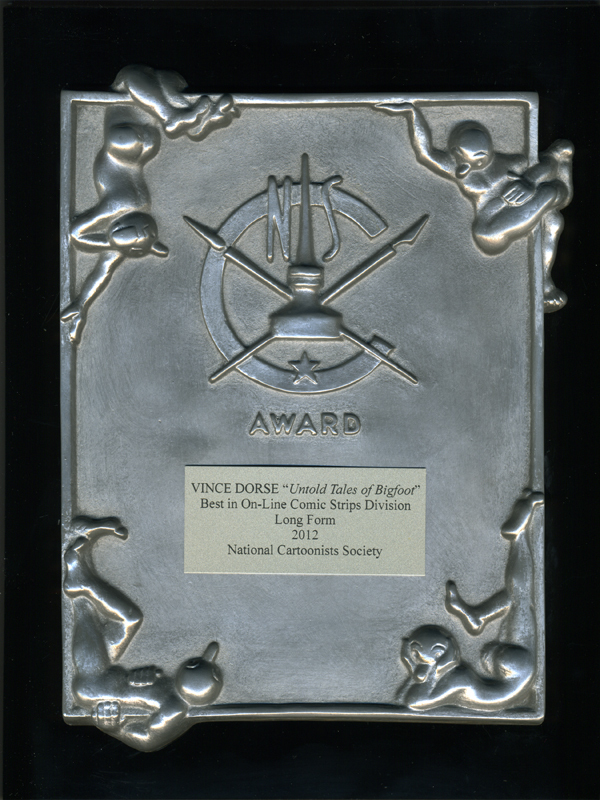 This is Bigfoot and Scout’s third nomination (they won in 2013). We’ve been buzzing about this here in the cave for the last few days, feeling very honored and grateful. Congratulations to my fellow nominees, John Allison and Ru Xu. Bigfoot and I consider the nomination itself a win, thrilled to be recognized alongside some other very talented creators. Scout, however, really wants the wall plaque and he won’t shut up about it. For a complete list of the nominees in all the divisions, CLICK HERE! Just a quick note to let you know that Untold Tales of Bigfoot : Crossing Paths has been honored with another award! This time we earned a Bronze Medal in the category of Graphic Novel, Humor in the 2017 Independent Publisher Book Awards. There’s a ceremony in New York that I may be too swamped with work to attend, but I hear they’re going to send me my medal. An actual medal. That oughta be fun. Congratulations to all the other medalists. 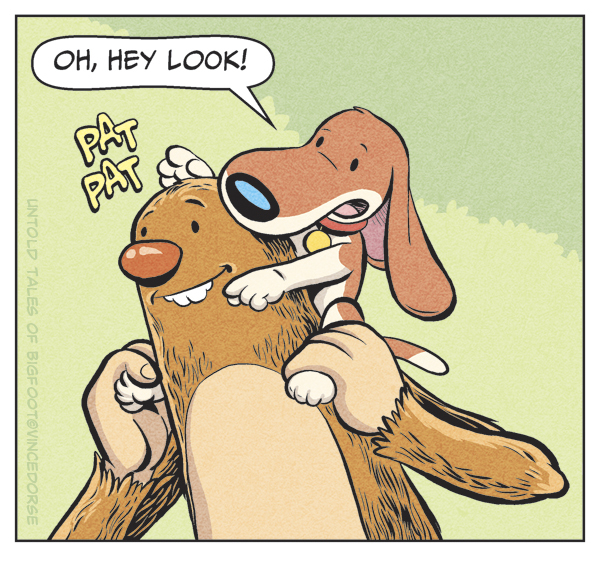 Untold Tales of Bigfoot Nominated for Second Reuben Award! (Finally posting this blurb so the news links on my sites have something to connect to). Amazingly, Untold Tales of Bigfoot was just nominated a second time for the National Cartoonists Society 2014 Silver Reuben Award for Best Online Comic (Long-Form). As you may recall, Bigfoot, Scout, and I won this award back in 2012, so this second nomination just a couple years later comes as a very welcome, if mindblowing, surprise. Once again, I’m nominated alongside some very talented people in the category: Mike Norton’s Battlepug, and Minna Sundberg ’s Stand Still, Stay Silent. Will I win this year? Doesn’t matter. It’s a huge honor for me to be nominated and I’m genuinely thrilled to be considered. Untold Tales of Bigfoot by Vince Dorse Wins Reuben for Best Online Comic, Long-Form. Untold Tales of Bigfoot started in August of 2012 as an experiment. I wanted to see if I could create a comic, upload it weekly, stay on deadline, and improve my skills as an artist and storyteller. By the end of that year UTOB had been nominated for a Cartoonist Studio Prize for Best Webcomic 2012 from The Center for Cartoon Studies and Slate Book Review, as well as a National Cartoonists Society Divisional Award for Best Online Comic, Long-Form, 2012. While the Cartoonist Studio Prize eluded us, UTOB did win the NCS’s Divisional Reuben for Best Online Comic, Long-Form. What a fantastic first year.